HomeMessage to Sheriff Stanek: Bring Deputies, Equipment Home from Standing Rock Now! Message to Sheriff Stanek: Bring Deputies, Equipment Home from Standing Rock Now! 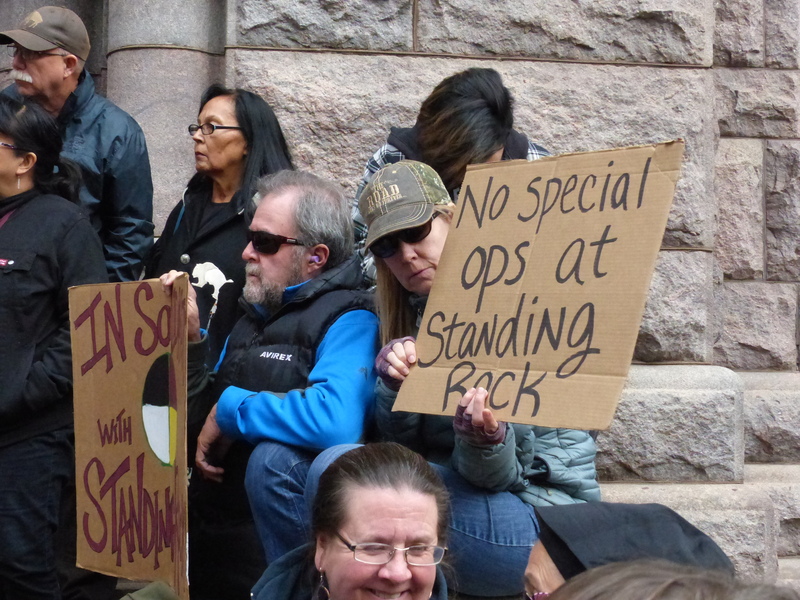 Hundreds attended a noon rally Tuesday to protest the Hennepin County Sheriff’s Office decision to deploy equipment and personnel against the water protectors opposing the Dakota Access Pipeline in North Dakota. 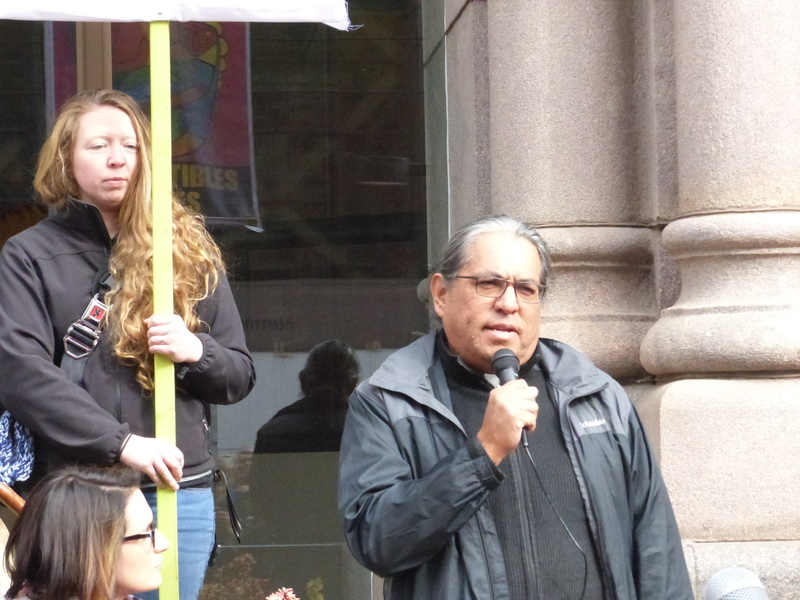 Approximately 400 Native Americans, faith leaders, environmentalists and their allies rallied near Hennepin County Sheriff Rick Stanek’s Office Tuesday to tell him it was unacceptable, even shameful, to send Hennepin County’s special ops personnel and equipment to North Dakota to suppress and intimidate the water protectors opposing the Dakota Access Pipeline. MPR reports that North Dakota law enforcement officials said today “they are poised to remove about 200 protesters trying to halt the completion of the Dakota Access oil pipeline in North Dakota after the demonstrators refused to leave private land owned by the pipeline company.” This appears to more deeply involve our Hennepin County deputies in the conflict — and on the wrong side of the conflict. The Dakota Access pipeline would cross four states, carrying fracked oil from North Dakota’s Bakken fields to Illinois for processing. The Standing Rock Sioux people and their allies oppose the pipeline because it would threaten their water and cut through their sacred land. (The pipeline would run under the Missouri River one mile from the Standing Rock water intake. The Tuesday rally was held on the sidewalk between the Government Plaza LRT station and City Hall, where Sheriff Stanek has his office. 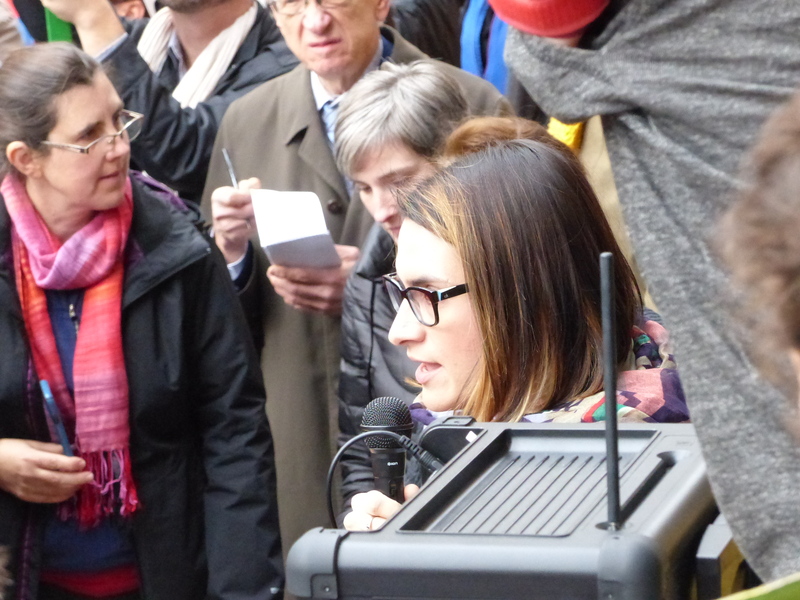 The rally included politicians such as State Senator Patricia Torres Ray, State Rep. Peggy Flanagan, and 9th Ward City Councilmember Alondra Cano. Flanagan, one of two Native Americans in the Minnesota Legislature, said: “This fight is personal for me. 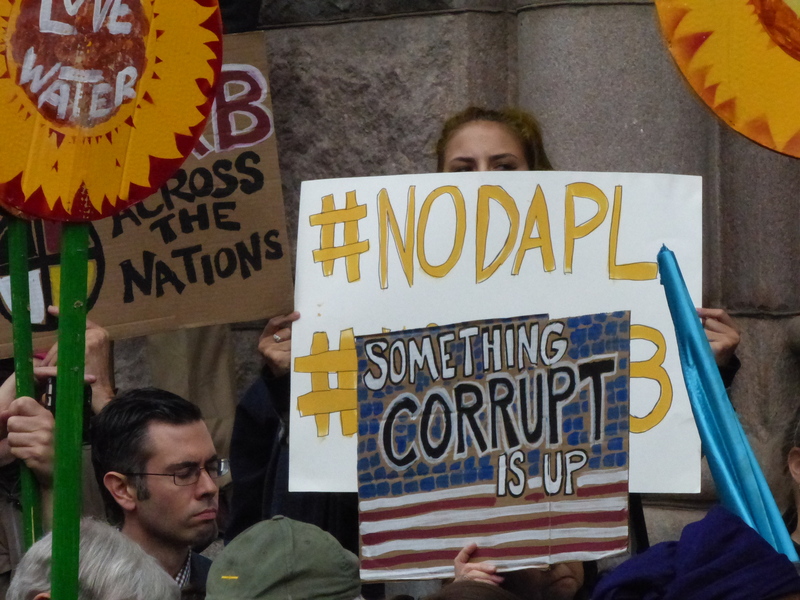 … By not protecting our waters, we are not protecting ourselves.” She also had this message for Sheriff Stanek: “You have the power to say no!” to sending deputies to Standing Rock. Due to escalated unlawful tactics by individuals protesting the construction of the Dakota Access Pipeline (DAPL) Morton County has requested additional law enforcement assistance from other states. The state of North Dakota made an Emergency Management Assistance Compact (EMAC) request to states for assistance on October 7th. Several states have responded and have arrived or will be arriving to support Morton County. State’s that are currently assisting Morton County are: Wisconsin, South Dakota, Minnesota, Wyoming, Indiana and Nebraska. 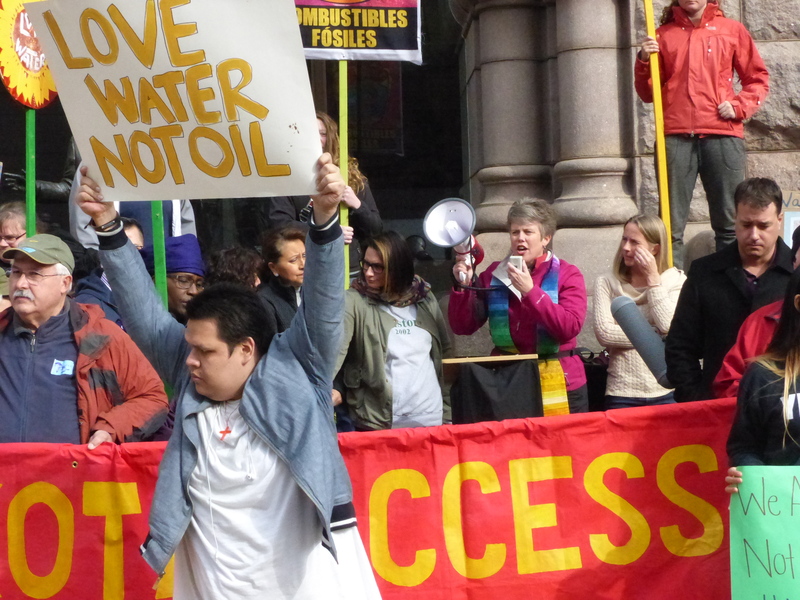 to the Dakota Access Pipeline and we call on all residents of Minneapolis to raise awareness about this important struggle for Indigenous sovereignty and environmental justice and to support the Sacred Stones Camp efforts in any way they can. According to rally organizers, Hennepin County sent 30 deputies. According to an MPR story on the rally, the Anoka County Sheriff sent six deputies with squad cars, and the Washington County Sheriff sent five deputies. North Dakota is supposed to reimburse local sheriff’s expenses. Still, Sen. Torres Ray has questions. 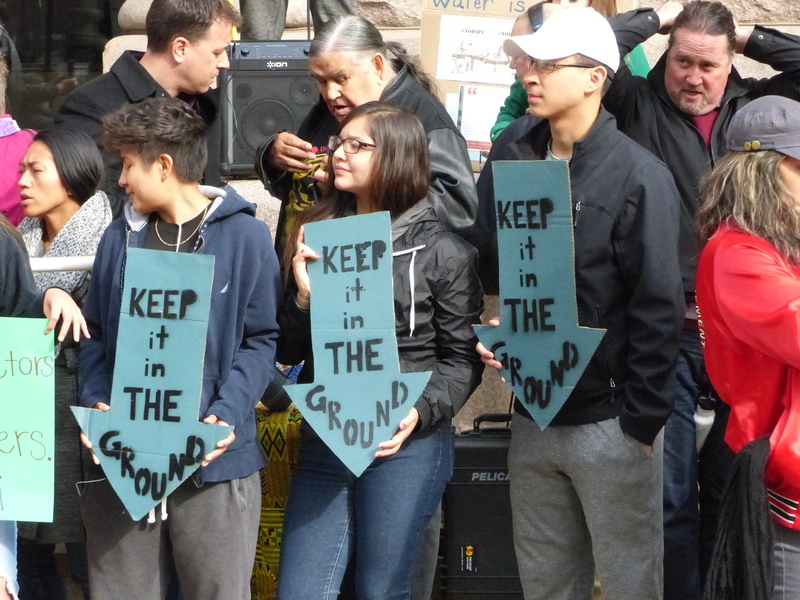 Speakers at the rally included Native leaders such as Joe Hobot of the Metro Urban Indian Directors (MUID), Clyde Bellecourt, co-founder of the American Indian Movement, and Robert Lilligren, president and CEO of the Native American Community Development Institute. 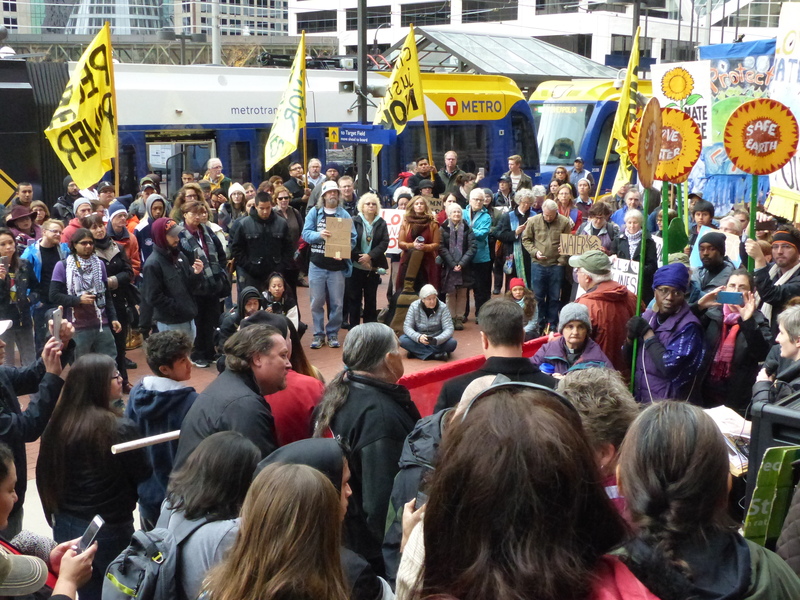 On behalf of all creation, with the full understanding that your actions today will be held to account by our children and our children’s children, the membership of MUID calls on the Hennepin County Sheriff’s office to stand together with our American Indian community who is in resistance to the Dakota Access Pipeline. Speakers included faith leaders, emphasizing that this is a moral issue. They included Rev. Canon Robert Two Bulls (Lakota), Missioner for the Department of Indian Work and Multicultural Ministries, Rev. Emily Goldthwaite Fries of Mayflower Church, and Rev. Dr. Rebecca Voelkel, Director of the Center for Sustainable Justice. A number of faith leaders also attended as allies. Those in the crowd included Rev. Lisa White Smith, Rector of Church the Epiphany in Plymouth and Rev. Randall Ramsdahl, senior pastor at St. James Lutheran in Crystal. Minnesota Interfaith Power and Light also supported the event. A number of major denominations have stepped forward with statements in support of the water protectors. See our earlier post: Religious Leaders are Standing with Standing Rock to Stop the Dakota Access Pipeline. 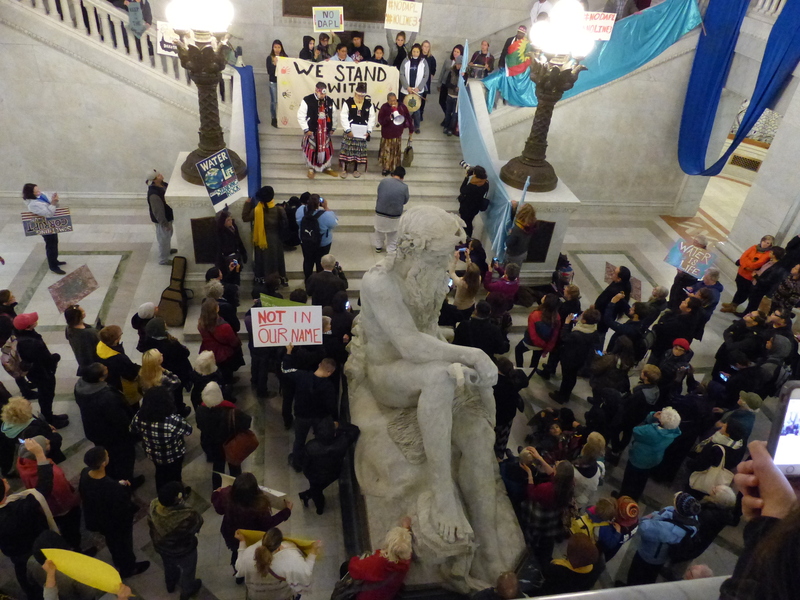 Following the outdoor rally, people marched inside City Hall and held another brief rally. Fittingly, they circled around the “Father of Waters” statue and sang while organizers delivered a petition to Sheriff Stanek’s office. Reporter after reporter confirms: the protesters have been nonviolent. Police have not. When protesters stand in prayer, police say they are rioting. When journalists film the protests, police arrest them as rioters. If prayer is a riot, then prayer is powerful — maybe so powerful that prayer can move the world, can stop the black snake, can save the waters of life for future generations. The North Star Chapter of the Sierra Club also supported the event.